HOLLYWOOD — About six years ago, Eric Osceola bought a 1989 box Chevy from a nephew and started fixing it up. A new hobby was born, but it grew into something more when he decided to customize the car and bring it to car shows. That old car, bedecked with the colors and logo of the University of Miami Hurricanes, became a crowd-pleaser and an award winner at shows around the state. Osceola bought more cars and frequented numerous car shops to get some of the work done. He met a lot of people at the shows who asked a lot of questions about his vehicles. Being surrounded by creative people who shared his passion motivated Osceola to open his own paint and body shop, Bigg E Customs, which has been open for about three years. Located on U.S. 441 and Johnson Street, the shop specializes in custom work, including paint, body, rims and lifts, audio/visual, fiberglass work, tires, alarms and custom graphics. 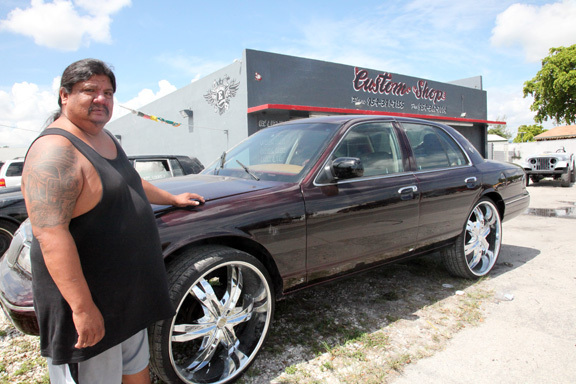 Before he opened Bigg E Customs, Osceola traveled the state attending competitive car shows about twice a month. His cars have won Best in Show several times, and he has more trophies than he can count. Now he only has the time to go once every couple months with his current show-stopper, a 1971 Chevy Impala convertible. 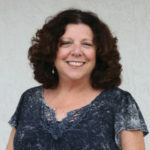 Being a business owner suites Osceola. The business caters to anyone who needs body work, as well as those who want to customize their vehicle. There are usually one to three cars being customized in the shop at any time, which leaves plenty of room in his 2,500-square-foot garage for walk-ins. The company is conveniently connected to insurance companies for referrals regarding accident repairs. Osceola enjoys cultivating relationships with car-part vendors and has made plenty of friends since opening the business. Customizing a vehicle can take one to two years to complete. For a show-quality vehicle, customization can cost $20,000 and up. A custom paint job can cost $5,000 to $10,000. “The first thing I tell someone is that it takes a lot of work and costs a lot of money,” he said. Osceola is currently working on a Cadillac he plans to paint in the Tribal colors and motif; he hopes to find a 1957 Chevy to customize with the same design. The shop’s logo features the car, which is from the year the Tribe was incorporated. Until he finds his ’57 Chevy, he will continue working on his other Tribal car. Bigg E Customs is located at 720 N. State Route 7 (U.S. 441) in Hollywood and can be reached at 954-391-7155. If you are a Tribal member and business owner who would like to be featured in The Tribune, email BrettDaly@semtribe.com.